Jennifer was one of my beautiful, wildly charismatic and ultimately up for absolutely anything brave brides. She and her best friend met me at Pilot Mountain State Park in Pinnacle, NC just north of Winston Salem. You can see the mountain rising out of the landscape for miles and miles. Its steep sides plummeting dramatically. I knew I would ask her to hang out on bluffs and dramatic crags so I could get breath taking imagery. But would she be up for it? Everyone is different on the phone than they are on the day of the shoot and I can never peg down who will go which way. When I met with our lovely heroine, she was happily looking at the scenery and sipping on champagne with her dress on and her hiking shoes underneath. I knew we were gonna have a blast! Jennifer climbed on parapits, she hiked up steep slopes, she all but repelled down deep drops to get into beautiful walled cavernous spaces. For this shot, Jennifer her best friend and I were hiking up one of the higher trails and the sun was starting to really get dramatic. I positioned our remarkable model between me and the sun, stopped down my aperture to create a silhouette, and asked her to recreate some dance moves I poorly acted out for her. (I like to photograph actions rather than frigid poses. They always feels so much more real. )This elegant movement was exactly what I was going for. Jennifer, leaning down to pick up the hem of her gown before she started to ascend up the mountain. I am so happy with this image! Location: Pilot Mountain, 1792 Pilot Knob Park Rd, Pinnacle, NC 27043. 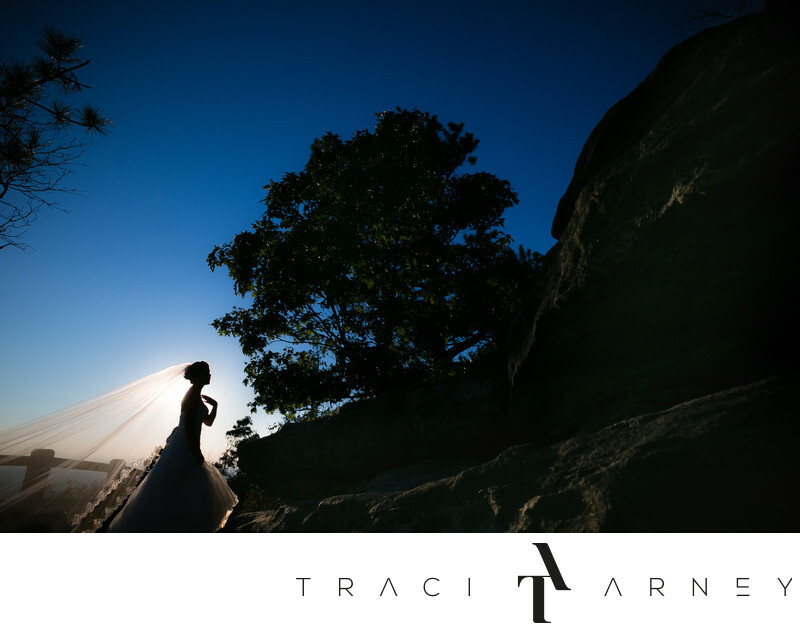 Keywords: Bridal Session (210), Destination Portrait Session (9), Hiking (3), Jennifer (12), NC (636), Pilot Mountain (69), Pinnacle (3), Portrait (117), State Park (3). 1/250; f/14.0; ISO 100; 24.0 mm.